There are few pretenses under which it’s considered ethical for a journalist to go undercover. Shane Bauer used Poynter’s criteria as a basis for weighing his decision: It has to be in the public interest, it has to be the only way to get the information, and any harm that might be prevented must outweigh harm that could be caused. With 130,000 people held in America’s privately-run state and federal prisons, there is a vested public interest in understanding how they operate. Because the companies that run these prisons keep their business practices and operations secret, it’s nearly impossible for reporters to find out what goes on within their walls. Inmate accounts suggest these prisons are operating in a dangerous and inhumane way, but there’s no way to verify inmate accounts without being able to see inside. And Bauer was up to the task. Just three years earlier, he was a prisoner himself. He was held captive in Iran for two years after he and his friends unknowingly came too close to the Iranian border while vacationing in Kurdistan. So in 2014, Bauer went to work as a prison guard at a privately run prison in Winnfield, La. He used his real name, job history and employer when he applied for the position. For a period of four months, he worked at Winn Correctional Center, often bringing with him a hidden camera and recording device. The resulting exposé in Mother Jones magazine won the National Magazine Award for Best Reporting, but Bauer wasn’t finished telling his story. His full account appears in his book, “American Prison: A Reporter’s Undercover Journey into the Business of Punishment,” and Bauer will be at Powell’s City of Books at 7:30 p.m. Wednesday, Sept. 26, to talk about it. Released this month by Penguin Press, “American Prison” weaves Bauer’s shocking experience as a guard with the brutal history of America’s penitentiary system as he explores the evolution of using inmates for profit. Street Roots spoke with Bauer in advance of his visit to Portland. Emily Green: A national prison strike recently made headlines, and in Portland, three protesters were arrested during a demonstration in front of a hospital (OHSU) they said is using prison labor to wash its linens for as little as 5 cents an hour. I was hoping you could put modern-day prison labor in context. Are today’s inmate laborers similar to American prison laborers of the past? Shane Bauer: There’s a long history of the use of prisoners for labor in the United States, from the very beginning of the prison system. The first penitentiaries in the U.S. in the late 18th century were essentially textile factories, and they were intended to turn a profit from the very beginning. A couple decades into the creation of the penitentiary system, these penitentiaries were actually making money for states through the use of inmate labor. This labor changed over time. Before the Civil War, in the South, prisoners were being used to make clothes and shoes for slaves at reduced prices for the plantations who owned slaves. After slavery ended, prisoners were used to replace slave labor. For all intents and purposes, prisoners in the South, for decades after slavery, remained slaves. They worked on plantations, they were whipped, and they were often tortured for not working and for not meeting quotas. They worked in coal mines for huge companies, like the U.S. Steel Company, and the work was so brutal and they were driven so hard that they actually died at a much higher rate than slaves did before the Civil War. Annual death rates in the South ranged from 16 percent to 25 percent of all convicts. It was a brutal system, and even after this period of convict leasing, where states were leasing prisoners to private business and private companies, states themselves bought plantations and were forcing prisoners to work on plantations. States were actually adding money into their treasuries from these prisons, so it was baked into the prison system that prisoners would be forced to work, and it was a money-making venture for states. 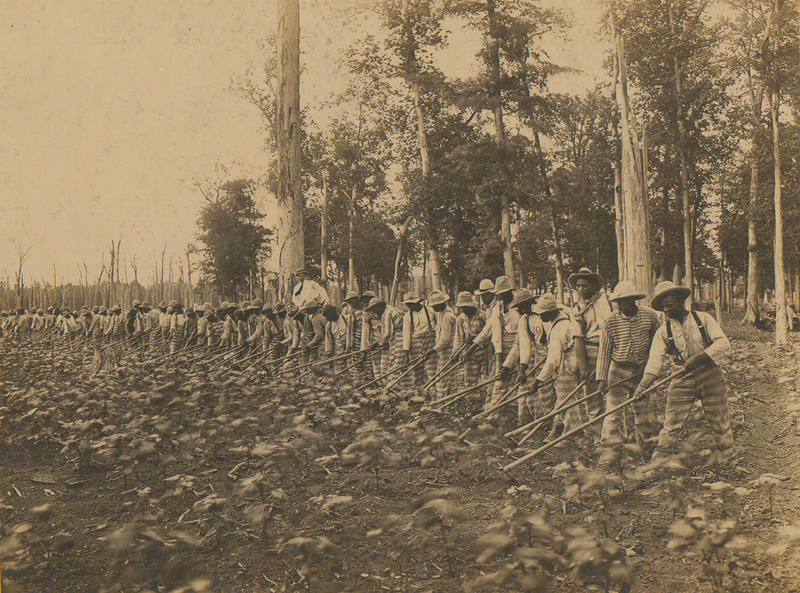 Convict labor with the Mississippi State Penitentiary in Parchman, Miss., circa 1911. Today, prisons are not bringing in money; they cost states a lot of money. But this kind of model of prison labor, while it may not be as brutal as it was in the 19th century, is still intended to offset the costs of running prisons. Without unpaid or very poorly paid prison labor, a lot of these prisons wouldn’t be functioning. They are completely dependent on prisoners to run them. FURTHER READING: Inside Oregon’s prison workforce: Exploitation or opportunity? E.G. : Corrections Corporation of America, now CoreCivic, which runs the prison you worked at, was co-founded by Terrel Don Hutto. Why was it important to detail his background in your book? S.B. : Hutto, in many ways in his CoreCivic career, is a link between the past of American prisons and the present of this new form of profiting from prison labor. When I dug into Hutto’s past, I learned that he started his career running a prison plantation where inmates picked cotton in an area the size of Manhattan. I found photos of the plantations that he ran, and they looked like you would imagine a slave plantation to look like: White men on horseback, standing over black men hunched over in a field, dragging bags of cotton. I tried to find any kind of information I could about what life was like on these plantations, and I found a memoir from a neighboring plantation where a man described being hung by handcuffs when he didn’t make his cotton quotas. I found evidence later of life under Hutto and other plantation owners where inmates would be put on the hood of a truck and driven at high speeds through the plantation if they weren’t meeting quotas. There were people who were in plantations at that time who were electrocuted if they were not meeting quotas. This is shocking to me that this was happening in the 1960s and 1970s. Hutto also lived on the plantation and had a houseboy – an inmate who almost always was black – who would serve him and his family, make their beds, cook their food. He lived this life that resembles the life, in many ways, of a slave owner 100 years earlier. What was also significant about him is that he later ran the Arkansas prison system, which was entirely made of plantations, and he ran that system at a profit to the state. As far as I know, he was the last person to run state-run public prisons at a profit. He started a career in the old model, and when that stopped being profitable, he came up with a new version. He co-founded the Corrections Corporation of America and figured out a way to capitalize on the overpopulation of our prison system. E.G. : How do you see his background and prior attitude toward inmates playing out in CCA prisons today? S.B. : I think it’s a reflection of a mentality where inmates are intended to get a handful of people rich. This has been the mentality of prison systems, especially in the South, for most of American history. The model of CoreCivic, of the GEO Group, is still based on this idea. If these companies are not making profit, they’ll cease to exist. One thing that was interesting in going through the history of these former versions of private prisons that we had in the 19th century was that the debates that existed around companies and prisons were very similar to what they are today. You would find op-eds where people were arguing that the profit motive and rehabilitation are at odds with each other. 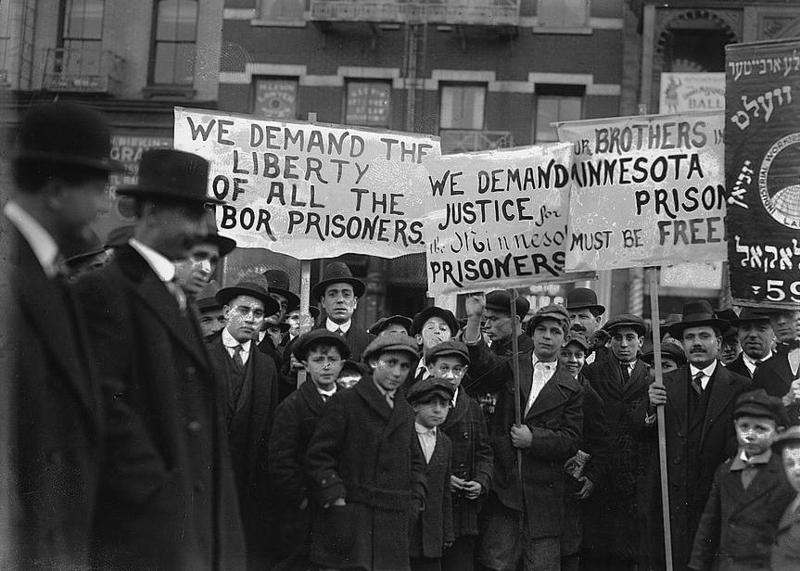 A labor sympathy parade in New York City, 1916. As soon as a prison is intended to make money, then whoever is running the prison is going to cut corners wherever they can, whether that’s on health care, food, security. It’s built into that model that the well-being of prisoners is going to be a lesser priority, and I think that’s the same today. E.G. : What you witnessed in the span of four months, I think, would be shocking to even some of the harshest critics of private prisons. What did you personally find most surprising or disturbing during your time working there? S.B. : I knew that there were issues with these prisons, but I was just not prepared for how chaotic and almost amateur the place would be. There’s always a sense of chaos there, and a sense that the company was not in control, and that it didn’t need to be. This has worked since the '80s, and states are saving some amount of money and they just kind of let things go. The prisoners were very violent; I saw people stab each other. The guards go home at night, but they, in many ways, also felt trapped there. They didn’t have other options, and they were working in the prison not because they wanted to, but because they just didn’t have anywhere else to turn, so they would take this very dangerous, very stressful job, for very low pay. E.G. : Do you think prisoners at CoreCivic facilities are treated better or worse than you yourself were treated when you were held prisoner in Iran? S.B. : It’s so hard to compare these two systems. The prison I was in, in Iran, was a political prison, so it was a different thing. I was in prison with activists, members of al-Qaida; people were tortured; we had to wear blindfolds when we left our cells. It was a very highly controlled environment. Winn was, in some ways, the opposite. Where Evin in Iran was highly controlled, Winn was out of control. It was running rampant. Every day, we didn’t know what was coming. Prisoners would blow up because they weren’t getting recreation time because there wasn’t enough staff to watch over them, or their classes were canceled because there was no one to teach them that day. The prison would occasionally go into lockdown because there weren’t enough people to run the place. And as much, the violence between prisoners was way higher. E.G. : I want to talk about your own transformation in just four months. At one point you mention the famous Stanford prison experiment, where students playing guards did horrible things to students playing prisoners. This experiment really shocked people and was cut short, but after reading your book, I’m left with the impression that it was less of an experiment and more of a representation of what is actually happening in America’s prisons every day. What do you think? S.B. : I will say that I related a lot to that study. I won’t say that every guard has the same experience that I did, but I was really surprised at how much I changed in that position, and how quickly. It really showed me how much your situation determines how you behave, how you think and how you react to what’s around you. It is very difficult to work in a prison, especially one that is run like this, where I had one other guard working a floor with me in a unit of 350 inmates. So it was impossible for us to do what we were supposed to do there. There was this kind of disconnect between what I was thinking and how I was acting, because I understood that the prison was a terrible place, and the conditions were horrible for prisoners, and if I was in their position I would be very angry. But at the same time, I’m a human being who is interacting every day with them and wearing a uniform, and I am the one who is locking them in, and there is going to be tension between us. When I have a problem, or some prisoner has a problem with me and is threatening me, then I have this personal reaction to that person and there inevitably ends up being battles between us, for power and control and authority. I found myself becoming very authoritarian and, at times, almost obsessed with the power dynamics that were happening between me and other prisoners, and my need to maintain control. It got to the point where I didn’t like the person I was in the prison. I would feel like I was a different person inside than I was when I went home. E.G. : It seemed like some of the guards entered the prison with a kind of cavalier attitude. Did you notice the same sort of transformation that you went through happening with any of the other cadets that you started with? S.B. : I did, yeah. Many of the cadets – at least half – quit very quickly, and that was common. But there was one, he started after me, he was very nice, trying to be an easy going guard, just trying to treat prisoners as humans, which a lot of guards did when they started. He became really hardened very quickly, and that was common. The other thing that was common is a lot of guards, when that started happening, they just quit. They realized it wasn’t worth it, for them. And I think guards often went in one of two directions. There is a pressure from both the side of inmates and the side of prison administration to basically join their team. You would assume that a guard would be on the side of the administration, but that’s not necessarily the case. Either they would decide they wanted to be liked by the prisoners and treat them humanely – sometimes they would bring things in for prisoners, drugs, cellphones – or they would quit because they couldn’t deal with treating people in the way that you kind of have to if you do that job. Or, they go to the side of the administration and they kind of turn off that part of themselves that might feel guilty about punishing somebody or forcing somebody to do something that they don’t want to do. Then they just kind of become numb to the human side of it and just do the job. E.G. : I was hoping you might be able to put what you learned about CoreCivic in the context of the ramped-up immigration efforts taking place in this country right now. Do you know if these detention centers are run any differently than the prison you visited? S.B. : I’ve never been in any of the immigrant detention centers. Over half of them are run by private companies. The vast majority of the largest detention centers are privatized. I did meet some guards who were filling in at Winn who worked in (immigrant) detention centers, and they would complain about not being able to use force on the detainees. There are some different regulations because the detainees are not convicted of crimes, necessarily. They would complain about how it was harder to use pepper spray on them, and stuff like that. But they’re essentially being imprisoned; they can’t leave. There’s been hunger strikes, there’s been riots in these detention centers over the same issues that have come up in the private prisons: poor health care, poor security, inadequate food. It seems that a lot of the same issues apply, which would make sense because it’s essentially the same model that the companies are applying. They are still trying to service their bottom line. They’re trying to cut the same corners that they do in a prison. E.G. : Is there anything we didn’t talk about that you’d really like to drive home about private prisons operating in America? S.B. : Something that I really learned in writing this book, after the initial article in Mother Jones, and just researching history, was that I think we should understand, is that while today private prisons represent a relatively small part of the overall prison population, the vast majority of the history of prisons in America has been driven by profit. I think it’s important for us to dig into this history and understand how we got to where we’re at today, and much of that explanation lies in the fact that people have been trying to make money from people in this country who are not free, whether they were enslaved or incarcerated people. What: Shane Bauer, author of “American Prison: A Reporter’s Undercover Journey into the Business of Punishment"